The morning fog was awakened by the cheerful Bhutan sunshine, making its way lazily for another bustling day in the capital. It was also time for us to make way for other hotel guests as we packed our bags and prepared to check-out from our wonderful room at Hotel Osel. Took a photo with Mr. Pema Dorji of Hotel Osel before we left the hotel, who had shown us great hospitality for the past 2 days. We were leaving the capital, Thimphu for Punakha today. Punakha was the capital of Bhutan until 1955. With slightly more than 70 km between the old and new capitals, our journey would take 3 hours easily through bumpy roads that were carved through mountains and valleys. Definitely not the easiest or most comfortable journey to look forward to. Leaving the capital in peak hour traffic. The traffic police officers have not been replaced by traffic lights. Apparently, they tried to implement signalised junctions before but it didn't work and traffic was in chaos. So they brought the man back in action. Some were rushing to work, some were still sleeping. Fortunately, there was a stop between Thimphu and Punakha. It wasn't just another roadside rest stop but the famous Dochula Pass with spectacular views to die for. Between October and February, one could enjoy this clear panoramic view of the Bhutan Himalayas (the rest stop café on the left and the Druk Wangyal Chortens on the right). Closing in at 200mm into the Jigme Singye Wangchuck Himalayan range, with soaring peaks in excess of 7,000 metres. They didn't look that tall because we were standing at no shorter than 3,100 metres above sea level. A useful information board, still very much hand-painted and nothing digital. It was a good rest stop from the bumpy ride. We spent more than an hour enjoying the spectacular views, the magnificent 108 memorial chortens, and had wonderful hot tea with biscuits at this café. The 108 memorial chortens, also called the Druk Wangyal Chortens. The 108 chortens were built by Queen Mother to honor the Bhutanese soldiers who were killed when fighting the Indian rebels in 2003. The 4th King led a volunteer army of about 7,000 men and forced the rebels out of the country. A panoramic view from the top of the small hill surrounded by the chortens. One could see a sweeping view of the Himalayan range from the top of the chortens as well. The arduous journey. There were plenty of road repair and improvement works, made worse by landslide leftovers. A big salute to our safe and skilful driver Mr. Sangye. We reached Punakha after more than an hour of dancing in the vehicle, and made a photo stop for the grand valley. By now, our attentive tour guide and driver had known our apparent interest in photography, and would make brief stops for any possible photo op. And this was the view of Punakha valley. Definitely worth a stop for a shot. Lunch time! A cosy and authentic family-run restaurant. Our sumptuous lunch. Healthy rice and delicious dishes to share. A very adorable boy in the restaurant who kept looking and smiling at us. Indeed, happiness is their way of life. Public toilets in Bhutan may not be luxuriously finished with polished marble or fitted with auto Grohe taps. But they are mostly clean and usable. In fact, I find many public toilets in Singapore in worse conditions than those in Bhutan in terms of cleanliness. For guys, you might get some scenic views while relieving yourself, and a good view of you relieving. Starting our 30-min walk to the famous temple of fertility - the Chimi Lhakhang. The stroll cuts through the quaint village of Sopsokha from our lunch venue. Along the way, we met several friendly local children and equally friendly pet dogs. Numerous houses in the Sopsokha village showcase wall paintings of phalluses, which owe their origins to the Chimi Lhakhang monastery few hundred metres away. Ubiquitous in Bhutan houses, these phalluses can be credited to Lama Drukpa Kunley who lived in the 15th to 16th century, also popularly called the "Mad Saint" or "Divine Madman". To the Bhutanese, they bring good luck and drive away evil spirits. It was a memorable experience walking across the vast paddy field between Sopsokha village and the Chimi Lhakhang monastery. A panoramic view of the spectacular valley. Try spotting the Chimi Lhakhang monastery on the hill rock. A leisure walk across the field, taking more photos and taking it slow. And our tour guide Mr. Jigme with his favourite pair of binoculars. Other than the commonly seen blue-white-red-green-yellow prayer flags, there are white vertical prayer flags as seen here. These are erected 45 days after the death of someone to honour, guide and protect the soul on its way into the next life. Magnificent views of the boundless paddy field in Punakha valley. Friendly dogs following and ushering us along the way to the Chimi Lhakhang monastery. Arriving at the Chimi Lhakhang monastery. It took us 35 minutes to stroll from our lunch venue to the monastery; crossing the village, the paddy field, and climbing uphill to the monastery. A huge Bodhi tree providing shade for visitors from the intense afternoon sun. A demoness once turned herself into a dog. But the Divine Madman, Drukpa Kunley recognised her and killed the dog and buried it. He then said “Chi-med”, or "no dog". The Chimi Lhakhang monastery building. The unusual black stupa is supposedly where the demoness dog was killed and buried. Walking downhill and back to our vehicle. Carefree children playing with the simplest things. No Toys R' Us or iPad needed. Our next stop was none other than the renowned and majestic Punakha Dzong. It is the administrative centre for Punakha district. It was also the venue for the wedding of the current King, Jigme Khesar Namgyel Wangchuck, and his fiancée, Jetsun Pema in 2011. Completed in 1638, it is the second oldest and second largest dzong in Bhutan. With its grand scale, beautiful proportions, and spectacular details, the Punakha Dzong was indeed a sight to behold. A panoramic view Punakha Dzong and the Pho Chu and Mo Chu rivers. Locals and monks on the busy wooden cantilever bridge. The current wooden cantilever bridge was a rebuilt and was completed in 2008. The original one was washed away by a flash flood in 1957. Honey galore. The bees are never fumigated for obvious reason in this country. The grand and steeply challenging entrance into Punakha Dzong. Stunning architectural details, carvings and paintings seen everywhere in Punakha Dzong. It's all about scale and proportion. A young and cheerful monk rushing his wet laundry for drying. The Little Buddha? Definitely not. That movie was shot in Paro Dzong. To our pleasant surprise, the charismatic and well-loved King of Bhutan, His Majesty Jigme Khesar Namgyel Wangchuck was visiting Punakha Dzong when we were there! We had been hoping to meet the beautiful royal couple and it was a dream come true! Well, it was half the dream as the Queen wasn't with him, unfortunately. When everyone knew about the King's visit through their tour guides, everyone was hanging around the courtyard and waiting patiently, as no one knew exactly when the King would be arriving. Of course, we wouldn't mind waiting at all! Moments before the King's arrival, the royal security had prohibited anyone from leaving. Everyone had to line up along two sides of the square courtyard as seen in the photo above, and we were standing on the side where above photo was taken. Strictly, no photos were allowed and this was a quick-snap while we were waiting for the Dragon King's arrival. We were amazed by how friendly the King was! To our surprise, after he had entered the courtyard, he started walking away from his entourage and bodyguards alone towards all of us and started asking where we had came from. Humorously, he made a comment that he couldn't tell who was a local and who wasn't due to the Gho and Kira many tourists were wearing. And he parted with a smile and polite greeting, "Very nice meeting you all here", followed by prayer-like hand greeting to his face. As he turned his back on us, fluttering his bright saffron Kabney in the Himalayan breeze and started walking into the building, we could still hear our heartbeats and everyone was speechless for a moment. It was a moment of disbelief that we came this far with a ridiculous hope to meet the King and it did happen on our third day! I must admit that this isn't the best levelled photo I've taken. Because it was taken in cold sweat with the camera slung at my waist when the security staff had looked away, just before His Majesty had walked into sight (arrived from the opening on the right and went into the building on the left). The whole courtyard was cleared for his entrance, well, except for the birds. It was time to leave Punakha Dzong. 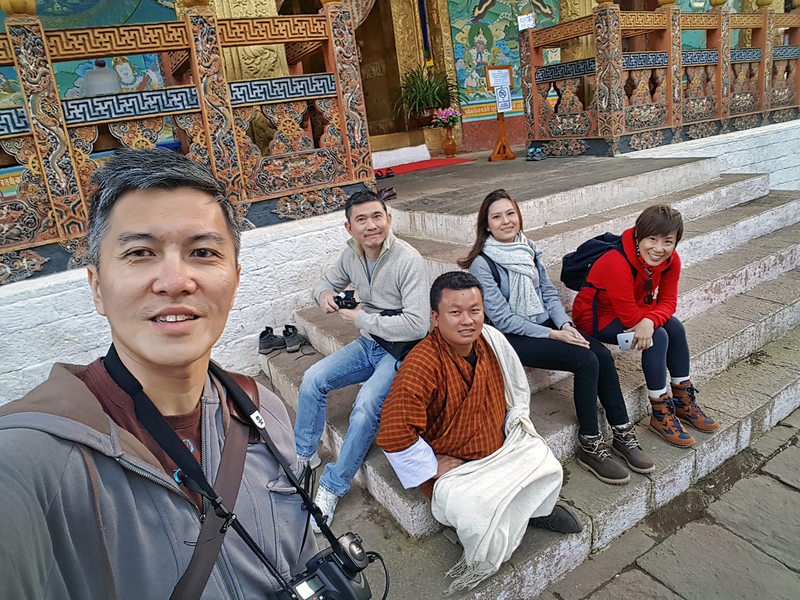 The colossal architecture with its stunning details, the cherry blossom, and wrapping up the visit with a royal encounter had made Punakha Dzong a very special place in our hearts. 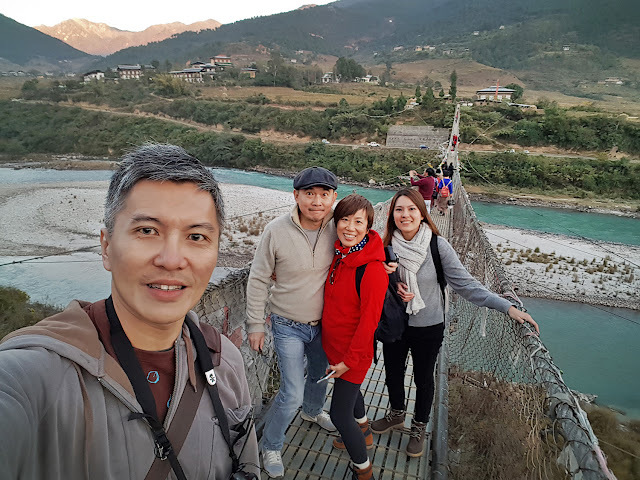 The Pho Chhu Suspension Bridge is a short 20-minute walk from Punakha Dzong. Measuring 160m across, it is the longest suspension bridge in Bhutan. Suspended across the turquoise Pho Chu river, offering spectacular views of the Pho Chhu valley. Getting ready to cross the rather frightening bridge. It wasn't easy at all walking across the 160m bridge, wobbling and trying to balance ourselves. It got a bit scary in the middle and I felt quite giddy from all the uncontrollable swaying. The locals were certainly doing it with grace and ease. Time to turn back. Another friendly kid with big bright eyes that smile. It's incredible how friendly and happy Bhutanese are. They would always pause, let us take a photo and smile at us. Lovely kids who were so eager to pose and let us have their photo taken. It had been a long and fulfilling day. Finally checking-in to our Punakha hotel - Hotel Lobesa. The night at Punakha was much colder than expected, almost freezing. Thankfully, the hotel had a good selection of drinks to keep me warm. Our sumptuous dinner buffet spread. Hot, flavourful and delicious local food, all served with big smiles. With such good food, great drinks and beautiful smiles, how could anyone not be happy in Bhutan? An adorable girl at the dinner buffet counter, serving dishes politely. Her sincere and innocent smile had definitely made our cold night a lot warmer. My amazing dessert - strawberry-flavoured ice cream drowned in a pool of local rum. This fabulous day would not be complete without some local beer to celebrate our chance encounter with the Dragon King. Everyone was still in a state of awe and disbelief that we had indeed met the King on this very day! Long live to His Majesty! Cheers! Weather in Dec is cool and beautiful. The sun can be harsh and intense in the day. A pair of shades and sunblock would be good to have. It could get warm in the day, especially when trekking up the mountains for hours. The option to layer multiple light clothing would be more sensible and convenient than one thick and heavy jacket. Temperature typically ranged from 15 to 20 degrees Celsius in the day, to freezing temperatures at night. Some hotels may not have very effective room heater. Hence, bring warm pyjamas just in case. Consider bringing a hot water bag to snug under your blanket (Hotel Lobesa had provided 2 and they were God-sent on that freezing night). 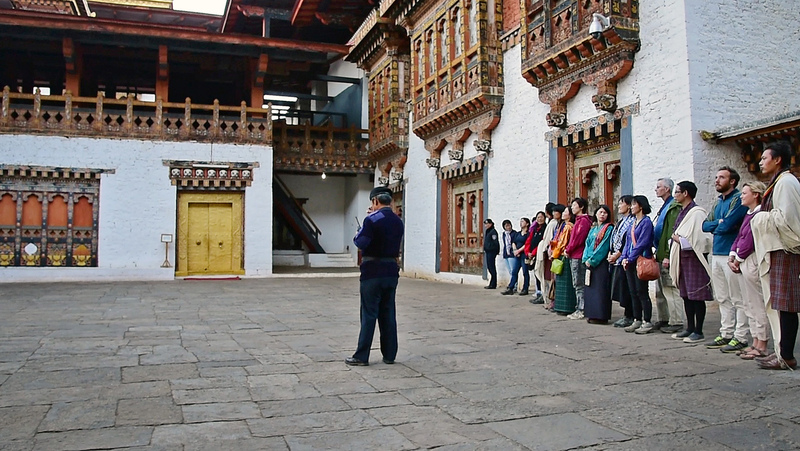 When visiting temples, Dzongs and places of importance, long pants and collared shirts/jackets would be required. For ladies, please wear long pants/skirts throughout the trip. Several places would require shoes to be removed before entering. Consider the ease of footwear removal if you do not wish to spend excessive time meddling with shoelaces. A set of traditional attire - the Gho and Kira will be prepared for all tourists. You may choose to wear it any day, or every day. The tour guide and driver will guide you through the art of wearing. Road condition was bad, as most roads were under repair or construction. The terribly bumpy road surfaces coupled with windy mountainous roads was the perfect formula for some dramatic motion sickness. Prepare for the worse - motion sickness medication, sour plum, mints, Axe Brand medicated oil, Tiger Balm; arm with them all if you need. If you know you are going to fall victim easily, request to swap with the tour guide for a front passenger seat, which I did for some parts of the journey before becoming Singapore's vomiting icon. Food was delectable and palatable. The 4 of us, 2 Singaporeans and 2 Taiwanese, had all enjoyed every meal with smiles and praises. Ask for their local condiments and chilli to add some exciting flavours to your meal. Staff at any restaurant would usually be happy to serve. Their local chilli cheese (Ema Datshi) would also fire up any bland meal you may find. Ask what your tour guide and driver are eating and you may be in for some flavourful surprises. Tuesdays are "Dry Days", which means, no alcoholic drinks are available. Visit Druk Asia (https://www.drukasia.com/) and start planning using their wide range of packages as a starting point. Contact their friendly staff if you have any question or would like to customise any part of the itinerary. It's not necessary to follow the itinerary strictly. You could arrange with your personal guide and work out a more "free-and-easy" programme when you are there. But your guide and driver would always be with you as there is no other way to get around this country. It's best if you book through Druk Asia and going as a small group with just your family or friends instead of booking tours through big travel agencies. You'll then be getting your own tour guide, driver and vehicle. The USD200 (off-peak) or USD250 (peak) per person per night includes accommodation, meals, and everything one needs in a day, minus frills and shopping. Ample bottled drinking water is provided daily in your personal vehicle and there is really no need to spend a single cent except for souvenirs, or at the Centenary Farmer's Market (Thimphu), if you are a fan of local flavours and ingredients. The sun can be harsh and intense in the day during this season. As you can see from the photos, most days were cloudless, which means intense direct sunlight hitting on your subject. The extreme high contrast in highlights and shadows would be a constant challenge for your camera's dynamic range. A fill-flash could be needed to eliminate harsh shadows on faces. Tango Cheri Monastery, Thimphu - 75 to 90 mins ascend, 60 to 70 mins descend. Chimi Lhakhang, Punakha - 40 to 45 mins (one-way) across the valley, paddy, and uphill. Pho Chhu Suspension Bridge, Punakha - 20 mins (one-way) from Punakha Dzong. Haa Valley View Trail - 60 mins descend (optional trekking to lunch). Tiger's Nest Ascend First Section - 40 mins by horse, or 90 mins by foot. Tiger's Nest Ascend Second Section - 120 mins by foot only. Tiger's Nest Descend - 80 mins + 50 mins (usually with lunch in-between). Bhutanese are generally very friendly and approachable. Most would love to have their photos taken. They are indeed a happy bunch and do not be shy to ask for a picture (wish I had done that more). Regardless, respect their preference and personal space. Some parts of temples and Dzongs do not allow photography, with or without flash. Please check with your tour guide if unsure before firing off like there's no tomorrow. Show necessary respect to the people, culture and religion, please. SO, TO VISIT OR NOT? WHEN TO VISIT? Still trying to read up endless travel blogs and wondering whether you should be visiting Bhutan, or when you should be? First, it's a myth that Bhutan is expensive, because the daily charges cover everything! Second, it's not true that it's hard to get a tourist Visa (in the case of Singaporeans). It could be more difficult to get an air ticket during peak season simply due to the limited flights into the country. It doesn't matter if it's the Happiness you are after or the Thunder Dragon you are seeking; or for us, just the Dragon King we were hoping to meet, there is every reason to make a trip to this magnificent country at least once in our lives. Or is there even the need for a reason at all? as long as it is the right person." As the King has rightly said, visiting Bhutan is perhaps as emotional and impassioned as his big day. It doesn't matter when, which season, as there is no right time or best time to visit this lovely country, because it is certainly the right and best place to be. These are really good clicks from bhutan, it looks a nice place to give visit. Loved it, I will definitely visit bhutan now. Thank you for sharing this post with us. In love with the photography, thank you for sharing it all with us. Loved this location, would love to be there. Welcome to my humble blog! It's not just about photographs and photography, but of image-making, memory-creating, meaning-adding and story-telling. To me, photography isn't about award-winning shots, but of heart-warming moments. It should embrace and enrich our travel experiences and our journeys should also be enriched through photography. Hopefully, the "+" is where we can all add meaning, stories, friendships, emotions and memories to the images we see and create.